The famous Zoom-Zoom moniker for Mazda is thriving in a literal sense when it comes to the brand introducing the all-new CX-3. 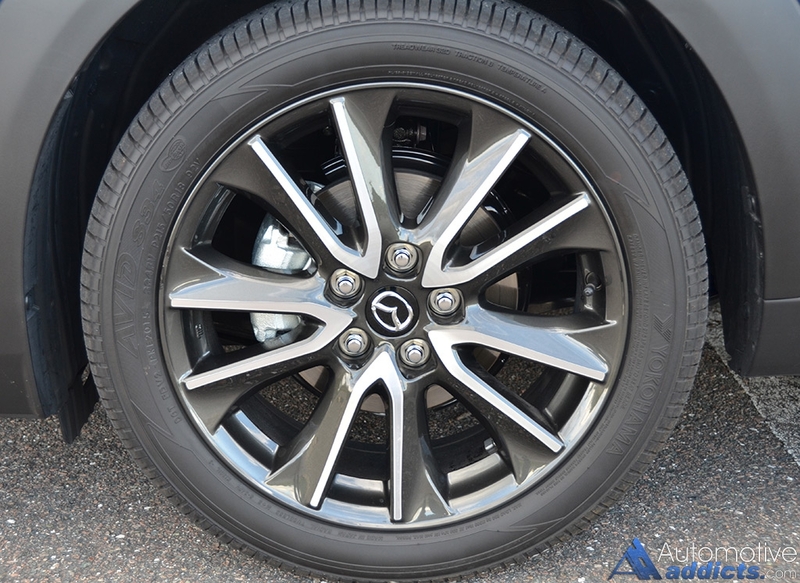 With its modest proportions building onto the Mazda2’s chassis to fit the mold of a desirable compact crossover utility vehicle, the brand has overcome my initial undecided impression considering how surprised I was after getting behind the wheel for a full week. 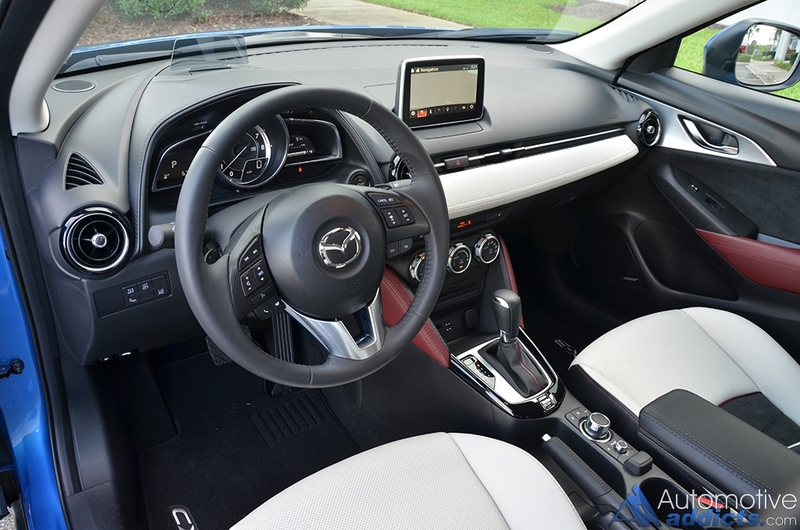 In my drive and assessment of the new Mazda CX-3 Grand Touring, one of the many compact crossovers to come into the growing segment for the 2016 model year, I am walking away enthralled with all that it has to offer in terms of available amenities, fit and finish, shear style, and best of all, its sporty driving dynamic. 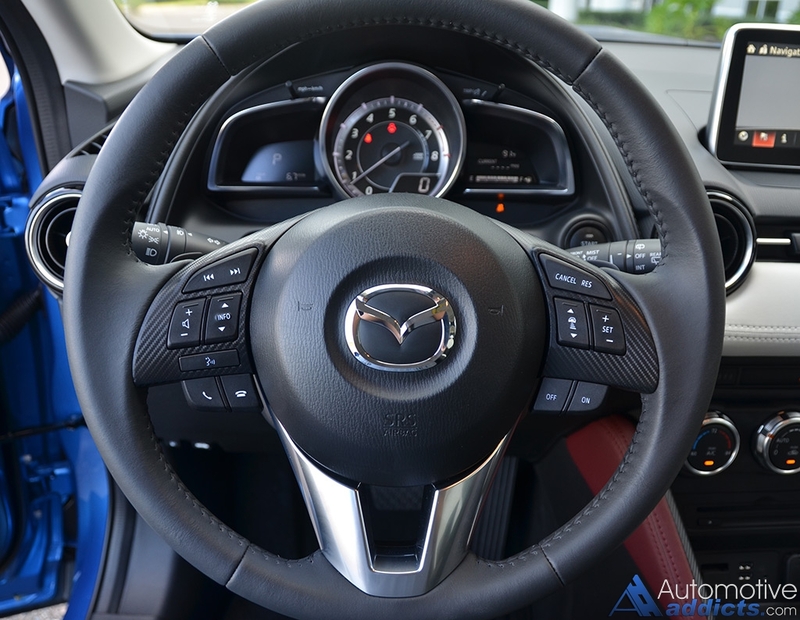 The new 2016 Mazda CX-3 dials up its stated on-paper performance numbers where its 146 horsepower and 146 lb-ft of torque 2.0-liter SkyActiv engine mated to a SkyActiv-drive 6-speed automatic transmission feels much more substantial than the pedestrian numbers exhibit. Call it what you want, Mazda magic or unicorn power, the CX-3 is lively and eager to appease light hearted enthusiasts. The Zoom-Zoom is real. 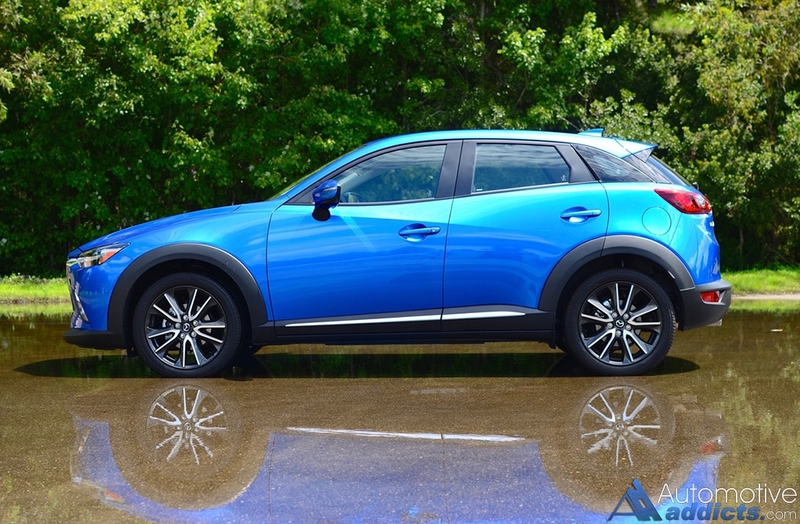 I found many desirable traits about the way the new CX-3 drives and behaves when pushed slightly harder than its size and segment classification would otherwise permit you do. As a compact crossover, the CX-3 handles remarkably well for its class and retains some feedback through its nicely-weighted electric steering rack. The steering proves to be among the best in class with a slight stiff and slow-to-return-to-center characteristic. I totally dig it. The eager 2.0-liter engine provides consistent and predictable power while the 6-speed automatic transmission is direct in its feel and shifts. There is hardly any use of the torque converter, which combines an additional clutch mechanism similar to a manual unit for a direct connection of gear selections. The use of such a clever transmission allows shifts to come on quick without any unwanted drama and perform seamless rev-matched downshifts, in addition to added fuel economy. In my CX-3’s front-wheel-drive setup (all-wheel-drive is optional on all trim levels -Sport, Touring, Grand Touring) and top level Grand Touring trim, it feels right at home and exhibits just how an enthusiast brand’s smallest crossover should feel riding on 18-inch alloy wheels wrapped in 215/50R18 all-season tires. 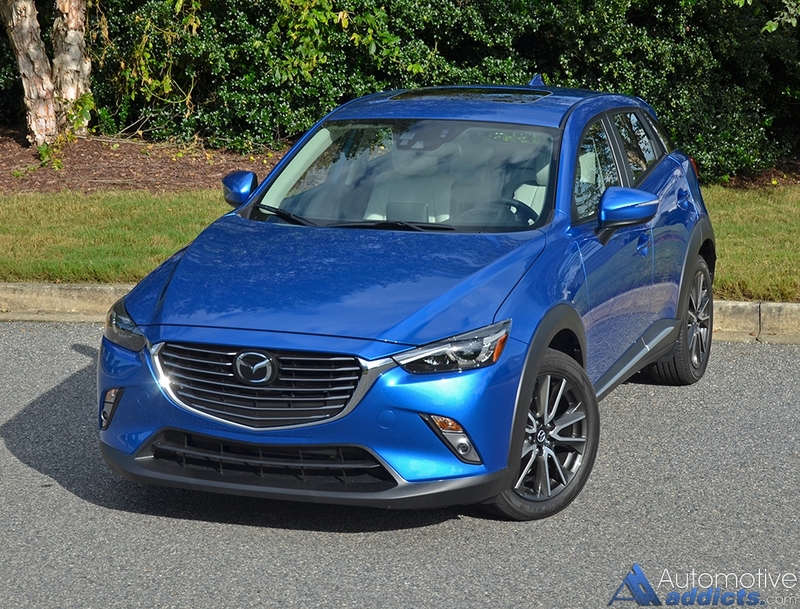 Fuel economy estimates in the current crossover segment are crunching down on some decent figures and the CX-3 is no exception getting an EPA estimated 29 mpg city and 35 mpg highway. I was able to match such figures during my time with the CX-3 only slightly missing the city mpg figure by about 2 mpg – mostly due to my heavy right-pedal action breaking the front wheels loose on occasion only to be stopped by traction control stepping in. 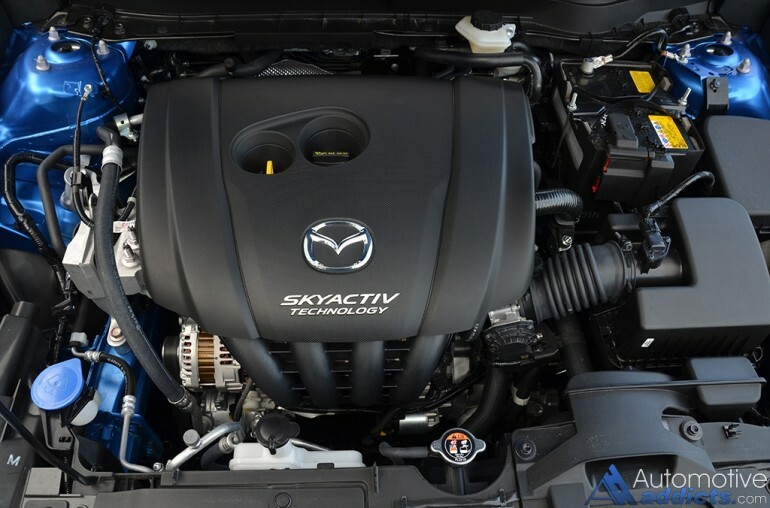 Use of the sport mode mostly adapts the 6-speed automatic transmission to hold onto gears longer and upshift sooner upon modest throttle inputs. 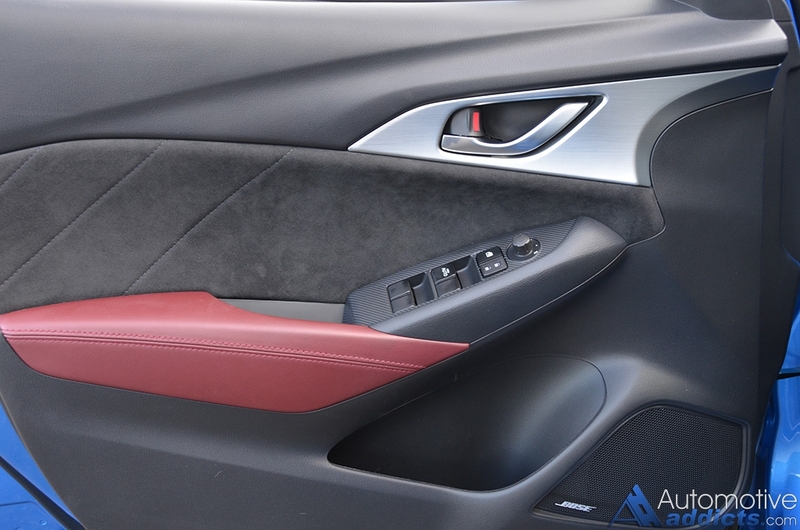 Mazda’s new interior language is almost as identifiable as the exterior fascia of the new Mazda3, 6 and latest crossovers. Use of a select amount of soft-touch materials are carefully placed in areas you would normally touch. While there is a good amount of hard plastics, their use is selective and never gives off a cheapened sense. The contrasting colors, stitching, and use of perforated leather trimmed seats with faux suede inserts all culminate a desirable cabin that is nearly luxury-like to the eye. 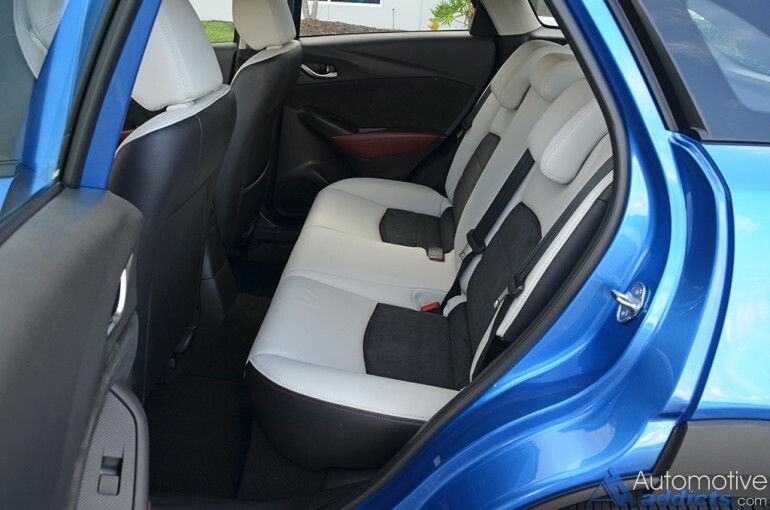 Where the comfort of the interior disappoints is the rear seating area. Bottom line, the rear seating is short on legroom even with the front seats pushed forward quite a bit. 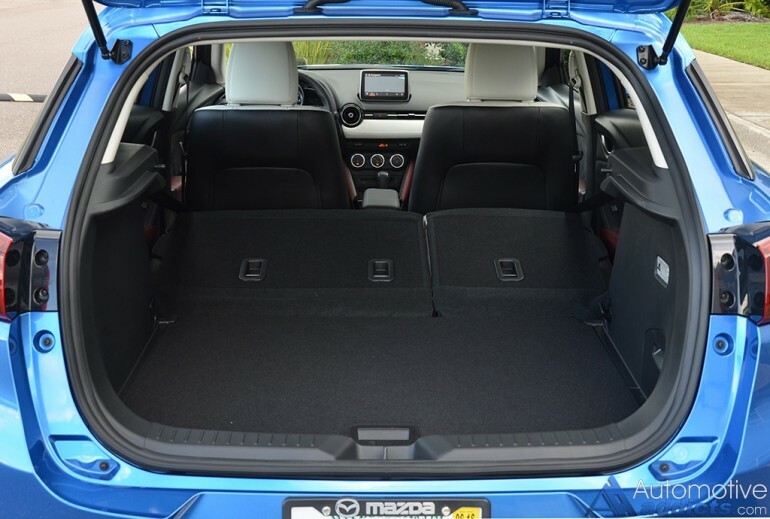 This shortcoming, combined with a smaller cargo area out back cut short on my CX-3 Grand Touring test vehicle by a few cubic inches due to the Bose audio system’s subwoofer equipment, is one of the few drawbacks that may not be overlooked by some compact crossover seekers. 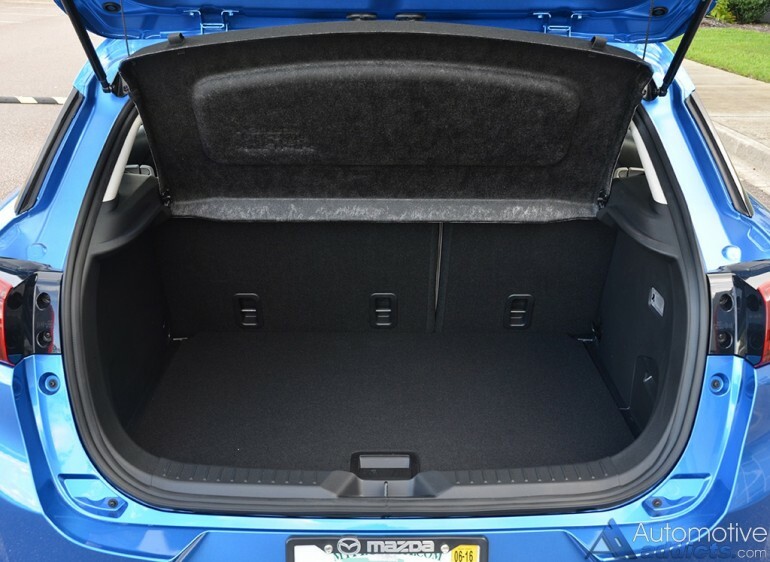 Fortunately, the front seats are comfortable enough for trips that deplete a full gas tank taking nearly 444 miles. 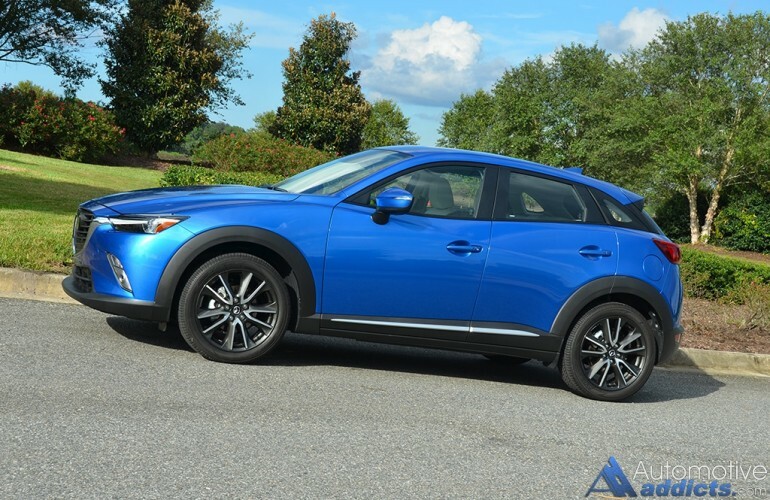 At the benefit of Mazda’s progressive thinking utilizing the best of modern technology, the CX-3 offers several active safety features and luxury amenities not normally found on this class of a vehicle. My CX-3 Grand Touring featured a GT I-ActivSense package that incorporates radar cruise control, smart city brake support (automatically applies brake when the system detects an eminent collision/object ahead at speeds below 10 mph – above 10 mph auto braking takes place with Smart Brake Support system), lane departure warning, auto on/off headlights, auto high-beam control and rain sensing wipers. 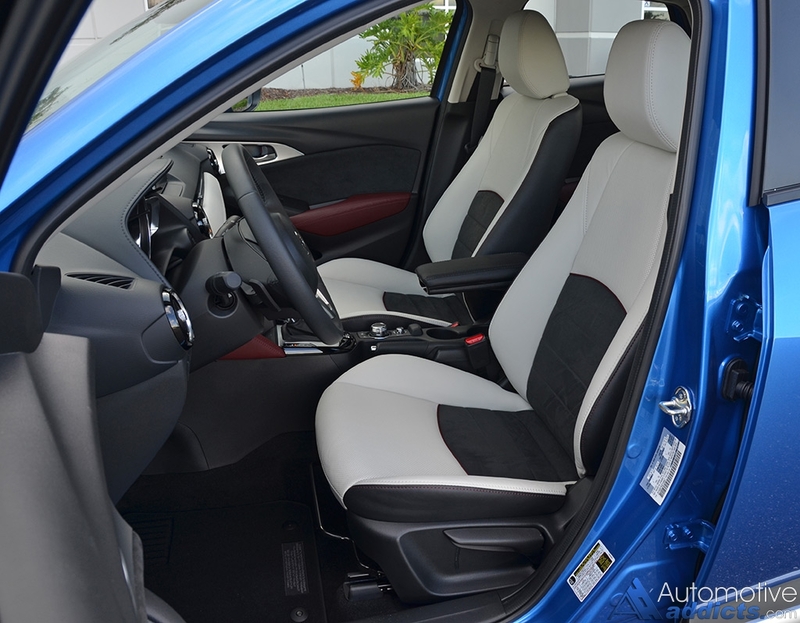 Allowing the CX-3 in its top tier Grand Touring trim to stand out from the crowd is left to sleek looks and its standard LED adaptive headlights, LED fog lights, LED taillights, blind spot monitoring, advanced keyless entry (passive entry/lock through door handle buttons, push button start – leaving key fob in your pocket), review camera w/cross traffic alert, and a Bose 7-speaker audio system with Bluetooth audio streaming (w/normal Bluetooth phone connectivity). My tester was equipped with a standard voice-activated GPS navigation system. I found use of the navigation system through voice activation a simplistic act allowing me to enter a full address in one sweep. 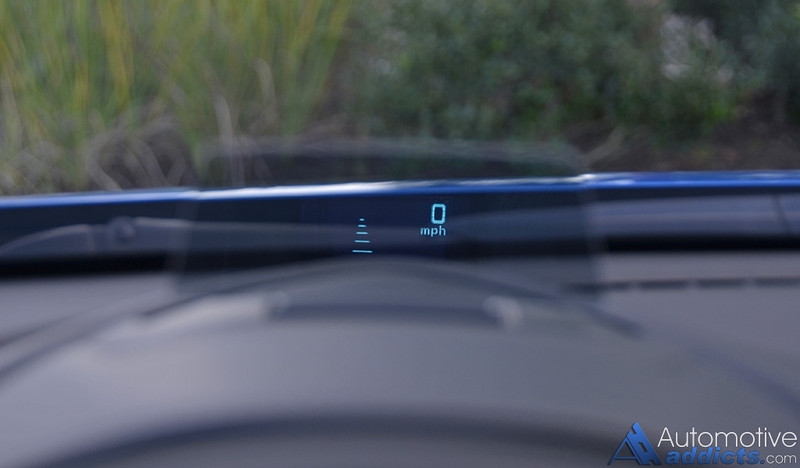 The 7-inch touch screen allows for use of its touch features when the vehicle is stopped while a poorly-placed central control dial and function buttons are used while driving (or parked). 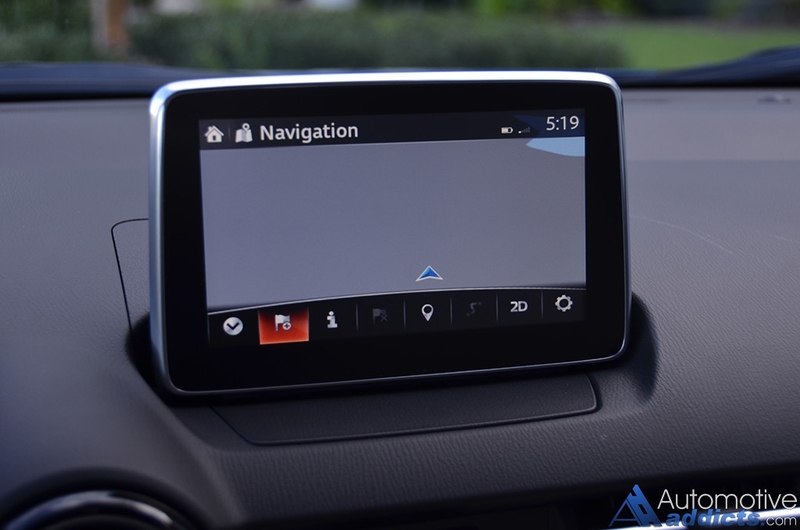 The major issue I found with the central control knob and buttons, combining the volume knob in the same cluster, is its position of being mounted very low and too far to the rear of the vehicle making it very uncomfortable to reach the set of controls. Elevating the set of controls and moving them forward would be ideal to rectify this lapse in ergonomics. 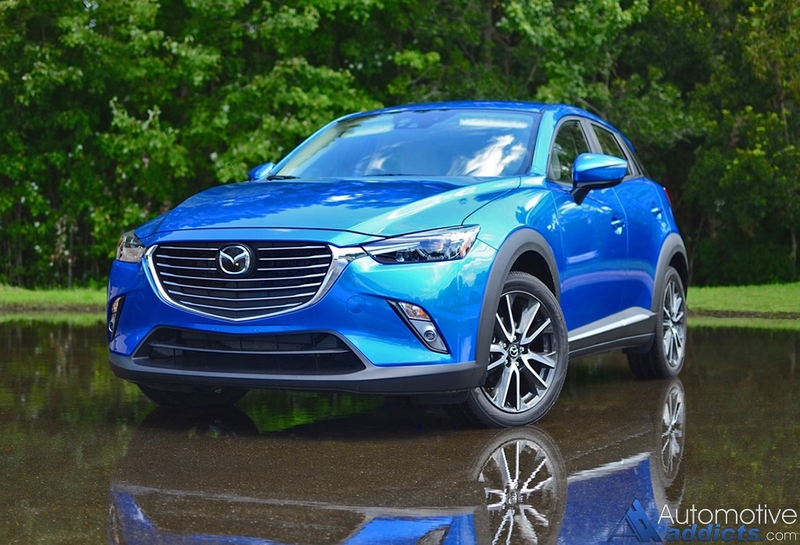 In totality, the Mazda CX-3 is among the best new entrants into a fast-growing segment. Crossover vehicles are gunning for precedence with a relentless attitude fresh out of the gates. 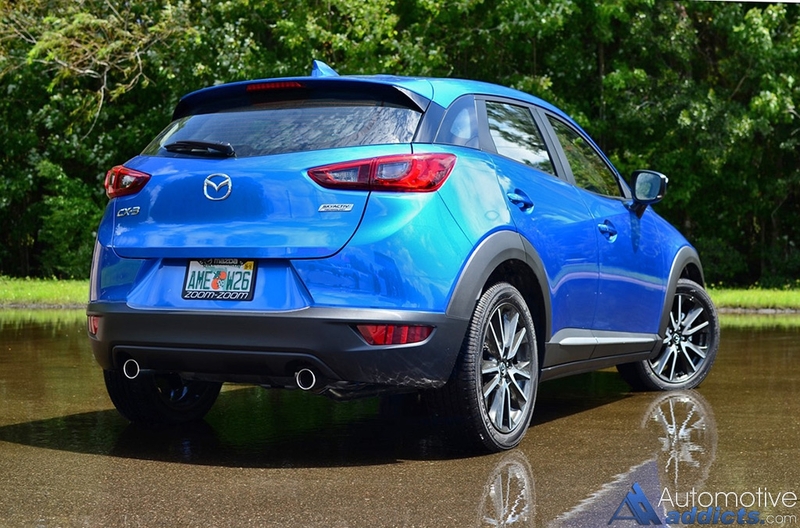 It’s safe to say that the CX-3 is leading this race when it comes to compact crossovers. 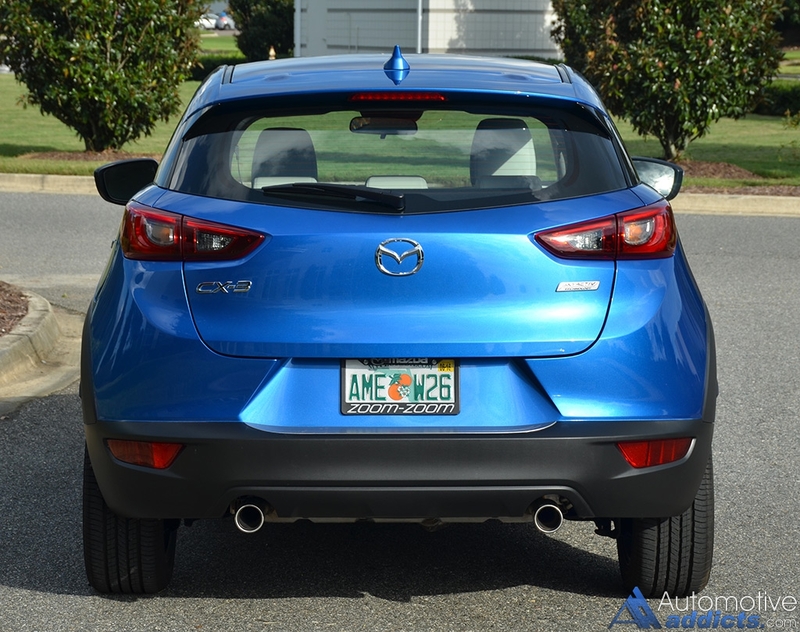 My 2016 Mazda CX-3 Ground Touring FWD test vehicle loaded up with the GT I-ActivSense package and Mazda mobile start, comes to an as-tested price of $28,440 including a delivery, processing and handling fee of $880 while a base CX-3 Sport FWD can be had for a starting price of just $19,960 excluding additional fees. Headroom: f/r 38.4 in. / 37.2 in. Legroom: f/r 41.7 in. / 35.0 in.